Sulawesi, or Celebes, is one of the most beautiful destinations in Indonesia. It’s the world’s 11th largest island. With abundant beauty and natural riches, Sulawesi could become one of the major nature-based tourism centers in Southeast Asia. Sulawesi has a distinctive shape that has often been compared to a spider. It lies just east of Kalimantan and north of Bali, and is divided into two regions, north and south. Makassar and Manado are the island’s major cities. North Sulawesi is mountainous with 54 peaks, some of which are active volcanoes. The coast features long stretches of white sandy beaches lined with thousands of coconut trees. The waters host magnificent corals and a wealth of colorful marine life. However, world-class muck diving also exists in the area. North Sulawesi’s Bunaken Marine Park is one of Indonesia’s pinnacles for underwater enthusiasts. Situated off the northeastern peninsula of the island, Bunaken is one of many smaller islands that form a dotted line between Sulawesi and the Philippines. Scientists consider the triangle between the Philippines, Bali, and Papua as the cradle of maximum marine diversity. Northern Sulawesi is located in the heart of this triangle. This relatively small region hosts more than 3,000 species of fish, 500 species of coral, and 30 species of whales and dolphins. It has the most diverse and profuse variety of marine life found anywhere in the world. The creation of Bunaken Marine National Park has helped conserve this rich underwater world, but additional research, conservation, and enforcement are necessary to minimize exploitation and the harmful effects of human activity on and around these islands. Sulawesi’s vast size and diverse landscape has yielded several distinct cultures. The rugged and remote interior helped isolate many traditional cultures, including the Torajah people, until the early 1900s. Meanwhile, other cultural groups on the island, such as the Bugis, have been seafaring fishermen and traders for centuries. Sulawesi’s first major empire was the Kingdom of Gowa, which arose in the 1600s. It was based in Makassar and controlled the port. In 1660, the Dutch attacked the port in Makassar, sunk several Portuguese ships, and captured the fort near the harbor. The Dutch forced the Gowa Sultan into an alliance and shut down the port—forcing traders to use Dutch ports elsewhere. The Dutch proceeded to rule the island with a firm grip and moved inland over the coming decades. In 1905, they began a violent offensive into the highlands of Central Sulawesi. After two years, the resistance was eliminated and the Christian missionaries began suppressing traditional beliefs and practices. The island also played a role in World War II. It served as a strategic outpost for Japanese troops in the north. Northern Sulawesi is divided into four districts: Minahasa, Bolaang Mongondow, Gorontalo, and the Sangihe Talaud Islands, all of which are home to distinctly different cultures. In North Sulawesi, the people of Minahasa exhibit a Western influence. They are very hospitable and friendly. The Minihasa people are known for their light skin and the majority are Christians. Their first contact with the Europeans came in the 16th century with the arrival of Spaniards and Portuguese spice traders. However, it wasn’t until the Dutch landed on their shores that they integrated with Western society. The province has retained its strong links with the Netherlands and many of the older people speak Dutch, in addition to Indonesian and Minahasan. Minahasans are proud of their political stability and natural riches. The traditional villages are rich in culture and most rely on the ocean for food. They voyage large distances in primitive, yet seaworthy, dugout canoes with colorful square sails. South Sulawesi has two of the country’s most interesting cultures—the Bugis and the Toraja. The Toraja live in a picturesque, mountainous region called Tana Toraja, or Toraja land. At the center of their culture is the belief of life after death. Death is an elaborate affair, and the prolonged funerals intrigue many visitors (who are often welcome to attend the ceremonies). The funerals typically involve feasting, buffalo sacrifice, dancing, and martial arts, culminating with a procession that carries the coffin to its final resting place in one of the many nearby caves, which dot the surrounding cliffs. Stone statues guard the entrances to the caves. The Toraja are equally famous for their unique family houses (tongkonan). They are built on stilts, with the roof at each end rising toward the sky. The shape emulates the horns of a buffalo, with the points always facing north and south. The shape symbolically connects heaven and earth. The Bugis is another interesting culture. These people are known for their seafaring skills, reside primarily around Makassar. Evidence of their influence has been found in Australia, where they had contact with the Aborigines. When the Portuguese, British, Spanish, and Dutch came, the daring Bugis often attacked the huge colonial vessels on the open sea. The Toraja are known for their woodcarving, baskets, and pottery. Embroidery and beadwork are popular in other communities around Sulawesi. Manado is reached by direct flights from Singapore, Davao, Denpasar, Jakarta, and numerous other Indonesian cities. Manado has a modern international airport. 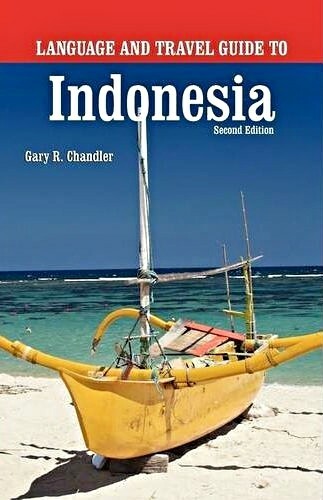 Bunaken, Siladen, Lembeh, and other islands are then accessed by boat. The travel infrastructure in Makassar also is fairly modern. It has a good airport with regular flights to Denpasar, Jakarta, and other major domestic destinations. Bitung (BEE-toong): This is the primary deepwater port of northern Sulawesi. This seaport carries trade between the Indonesian islands, as well as Singapore and the Philippines. Bunaken (BOON-ah-KEHN): Bunaken is a paradise for snorkeling and scuba enthusiasts. The coral reef off Bunaken island is world-class and shouldn’t be missed. The drop-off wall at Liang Cove is rare with caves, gullies, and caverns harboring an immense wealth of marine life. The water averages a warm 82 degrees Fahrenheit and visibility often is more than 90 feet. The Bunaken sea garden is rich with colorful tropical marine life. It’s about half an hour from Manado by speedboat. Bunaken Marine Reserve (BOON-ah-KEHN): The reefs of Bunaken Marine Park have been compared in richness to that of Australia’s Great Barrier Reef. Miles and miles of prime marine habitat have been set aside solely for the enjoyment of divers, snorkelers, and researchers. Near Manado, Bunaken National Marine Park has stunning reef sites and sheer walls that drop hundreds of feet. 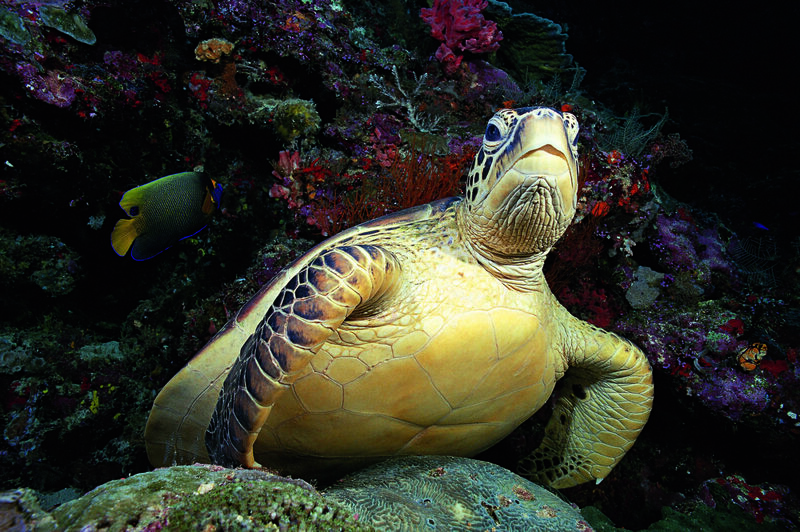 On a single dive the visitor can see 50 species of coral, barrier reefs, mangrove reefs, and wall dives. An abundance of fish and mammal species thrive here, including seahorses, three species of turtle, rays, and sea snails. The enormous, bottom-grazing dugongs are local marine mammals that are closely related to the manatee. Dugongs also are found in these waters. The whale shark, the world’s largest fish, has been seen in the area. The island of Manado Tua provides an opportunity to dive into the lake inside the crater of an extinct volcano. Siladen is another diver’s island in the park. It is a mere 200 yards away from Bunaken. It costs 50,000 rupiah per day for a park pass. A one-year pass is available for 150,000 rupiah. Gorontalo (GOHR-rahn-TAH-low): This is the capital city of the Gorontalo Province—the newest province in Indonesia, which was proclaimed in 2002. The port city has about 140,000 people and is the center of this prosperous region. Lake Limboto is a peaceful place near town and Pantai Lahilote is a nice white beach nearby. Lombongo hot springs is about 10 miles away. It has a swimming pool filled with warm mineral water. Gannga Islands and Bangka Island (GAHN-gah, BAHNG-kah): This area is home to the Bajau fishermen, who moved here centuries ago. These islands are just off the northeastern tip of Sulawesi. They are the first of the Sanghie Islands that lie between Sulawesi and the Philippines. Formed by volcanic activity, these islands are now lush with tropical rainforests. They feature coral reefs and white sandy beaches. They also serve as a halfway point on the coastal route between Bunaken and Lembeh Strait. Kendari (KEHN-dahr-REE): This is the capital of the Southeast Sulawesi Province. Every April, it has the Festival Teluk Kendari, which is the highlight of the year. It has traditional music, dragon boat races, and other festivities. It’s a friendly town with plenty of places to stay. Lembeh Strait (LEHM-beh): Lembeh Strait is renowned for its incredible abundance of macro marine life. The Indonesia government might designating it as a marine park. The area is known for its amazing muck diving, which reveals unusual and often undocumented creatures. Divers see the marine life against a black sandy bottom. The island itself is lush on this side. A large rock sits in the middle of the channel. It forms a massive arch that allows the waves to pass below. Kungkungan Bay Resort is one of the highlights in the area. A comfortable place right on the beach, it has beautiful views across the channel that can be enjoyed from the restaurant, which is casual, but world-class. Lembeh Resort is another simple but comfortable diving resort across the channel. Lembeh strait is one of the most beautiful places in Indonesia. Divers and non-divers alike should experience it. The area is about an hour east of Manado. Notice the frequent churches and mosques that share the same block in this region. Makassar (MAHK-ahs-SAHR): This is a bustling port city with more than 1.3 million people. It is home to the famed Bugis boat experts and a great place to see some of their ships at Pelabuhan Paotere (the local harbor). Fort Rotterdam also is a local relic of the Dutch occupation and one of the most impressive examples of colonial architecture in the city. Gunung Lompobatang is 50 kilometers from the city. Tana Torajah and the Mamasa Valley are about 250 kilometers north of Makassar. Mamasa Valley (MAH-mah-SAH): This village and valley is in the west part of South Sulawesi. Mamasa is a cool mountain resort with great hot springs. It hosts a similar culture to the Toraja people. It sits high in the mountains at around 3,600 feet. Manado (MAHN-ah-DOH): This municipality is the capital and commercial center, not to mention the main gateway to North Sulawesi Province. Several volcanoes surround Manado, including Klabat, Soputan, and Lokon. Manado Tua Island (MAHN-ah-DO TOO-ah): Manado Tua is the main island in the Bunaken area. The path to the top of this volcanic island takes several hours to climb but the view includes all the islands in Manado Bay. The area is superb for snorkeling and diving, and ideal for corals and sponges. The beach is a mixture of white sand and coral formations. Palu (PAH-loo): This city is the capital of Central Sulawesi. It’s dry, hot, and serves as the gateway to Lore Lindu National Park. Visitors can buy park permits at the park office in town or at field offices along the way. There is an interesting museum in town, the Museum Negeri Propinsi Sulawesi Tengah. Tanjung Karang is a nearby beach area with good snorkeling. More than 280,000 people reside in Palu. Rantepao (RAHN-teh-PAO): This is the largest town and business district in Tanah Toraja and a convergence of travelers. It serves as a good base for local tours in Toraja land. It rains here daily and the local market only happens once a week. Flights in and out of Rentepao are available via Makassar. Siladen Island (SEE-lah-DEHN): This tiny island is just a few hundred meters from Bunaken in the Bunaken National Park. 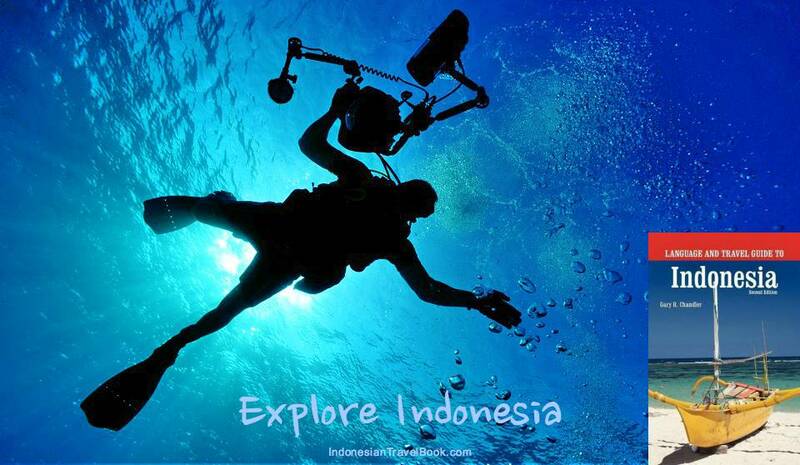 It has the same general diving opportunities offered from Bunaken. Tanah Toraja (TAH-nah TOH-rah-JAH): The Toraja people live in a picturesque, mountainous region called Tana Toraja, or Toraja land. Their belief system is based upon their view of death and the afterlife. The Toraja are equally famous for their houses, which are called Tongkonan, or family houses. The houses are built on stilts, and each end rises like the horns of a buffalo, with the points always facing north and south. The shape symbolically connects heaven and earth. Visitors reach Tanah Torajah via Rentepao. Tara-Tara (TAHR-rah TAHR-rah): This village has traditionally been the center of Minahasan culture and arts. Traditional dances are performed in the open air at Kemer Garden. There are Japanese caves from World War II at the Ranowangko dam. The Kemer natural spring is nearby in the shadow of the volcanoes. Just 15 kilometers southwest of Tasik Ria, Tara-Tara is easily reachable from Manado by public bus or taxi. Danau Linow (DAH-now LEE-now): This small lake is fed by a geothermal spring, which gives the lake a two-tone color. The sulphur causes a bright green color in the water near the inlet of the lake. The lake is a good place for a picnic in the mountains. Just outside of Tomohon. Danau Poso (DAH-now POH-soh): This is Indonesia’s third-largest lake, located in central Sulawesi. The lake is famous for its wild orchids, which can be viewed at Taman Angrek Bancea. The towns of Tentena, Tindoli, Taipa, and Pendolo surround the lake. Dumoga Bone National Park (Doo-moh-GAH BOH-nay): Located on the border between two districts, approximately 260 kilometers from Manado. The mountains and hills are covered by dense forests and vegetation, which makes it an ideal reserve for rare and special animal species such as maleo birds, anoas, hornbills, wild pigs, tarsius, and fruit bats. The rainfall favors a very rich flora. This National Park has several cottages and small restaurants for visitors. An entry permit should be obtained from the Sub Balai Konservasi Sumber Daya Alam (Nature Conservation Office) in Manado. Lake Tondano and Remboken Tourist Site (TOHN-dah-NOH, REHM-boh-KEHN): The drive to Tondano passes through picturesque villages and clove plantations. Situated right on the edge of the lake is the Remboken Tourist site, an ideal place for water skiing, fishing, and boating. Bungalows, a hot water swimming pool, and restaurants are available. Lake Tondano is about 36 kilometers southwest of Manado, 600 meters above sea level. Lore Lindu National Park (LOHR-reh LEEN-doo): This large national park is extremely remote and few people travel here. Attractions include large megalithic rock formations, high peaks, waterfalls, hot water springs, unusual birds, and a beautiful lake. Visitors can take short hikes in the park, but guides are required on longer treks that can last several days. Lindu is a collection of four indigenous communities—Anca, Tomado, Langko, and Puroo, which suround Lindu Lake. Just south of the city of Palu. Otanaha Fortress (OH-than-AH-ha): A shelter and defense base of Gorontalo kings during the colonial era. It is said that the fortress was built with a mixture of sand, calcium and eggs of Maleo birds. Located in the western part of Dembe village. Japanese War II Caves: Japanese soldiers built the caves during World War II to store supplies. This is a cavernous hillside area along the road between Kiawa and Kawangkoan. Japanese Monument: Bitung played an important role during World War II as a home base for the Japanese Imperial forces. It also became the last resting place for the soldiers who died in the war. Both the Japanese and North Sulawesi Government jointly founded this monument. Located in the village of Bitung. Karumenga (KAHR-roo-MEHN-gah): This town has hot baths that originate from hot volcanic springs, which attract people for relaxation and health reasons. Lake Mooat (MOO-aht): Situated in the highlands about 900 meters above sea level, this lake is a nice, cool place to visit. It is surrounded by dense forests, which abound with birds of various species. The located is in the district of Bolaang Mongondow. Visitors can reach it by bus. Mantani Equestrian Center (MAH-tah-NEE): Trail rides are available daily and riders can choose from two trails. One is called the Wawu ride and reaches vistas where riders can see the local volcanoes and Lake Tondano in the distance. The Wahulan ride goes through the jungle. Located outside of Manado. Mount Mahawu Volcano (MAH-hah-WOO): The views of the valley below are worth the trip and the two tall volcanoes in the distance are equally stunning. Visitors can see Mahawu smoldering steam below. 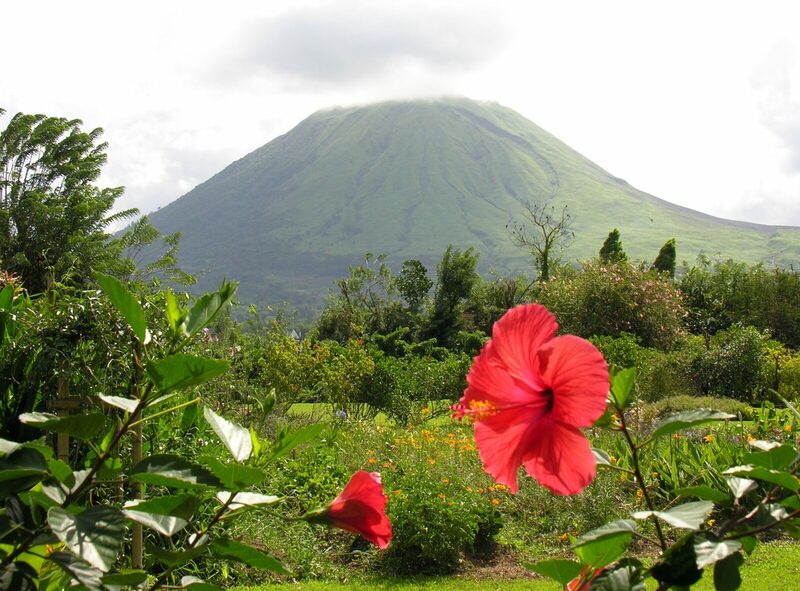 The base of the mountain is just a few kilometers beyond the city of Tomohon. From here, it takes about an hour to hike to the top of the volcano. Ranopaso (RAHN-oh-POH-soh): Rice fields surround this hot water bathing spot. Bungalows are available at Koya village. Located about three kilometers from Tondano. Sangihe-Talaud Archipelago (SAHN-gee-HEH TAH-lah-OOD): The remote reefs and fish life of the Sangihe-Talaud Archipelago are world class. This area lies north of Manado and is dominated by Mount Karangetang, a volcano that reaches 5,900 feet high. This chain of steep and lush volcanic islands connects Indonesia with the Philippines. It is one of the most scenic regions in all of Indonesia. Several of these volcanoes are still active, such as spectacular Siao, a rainforest island that rises up nearly 5,000 feet above sea level. The abundant marine life and magical reefs surrounding these islands are only accessible by a live-aboard boat. The reefs along the Sangihe-Talaud coast are remote, pristine and world class. These islands are among the most unspoiled in Indonesia, and considered by experts as the pinnacle of marine biodiversity in the world. Sperm whales, pilot whales, melon-headed whales, and numerous species of dolphins are sighted traveling in enormous pods in this region. In addition, pods of rare tropical killer whales are sighted here occasionally. One of the most amazing geological features of this archipelago is the active Mahangatang volcano, which is underwater near Siau. Divers and snorkeling enthusiasts watch it spew volcanic gases below the surface of the ocean. Sarone Island (SAHR-oh-NAY): A beautiful, tiny island with white sandy beach for swimming, boating, snorkeling, diving, and water skiing. Located in the district of Gorontalo. Tangkoko Nature Reserve (TAHNG-ko-ko BAH-too-AHN-goos): This nature reserve is located on the slopes of mount Dua Saudara, an area composed of impressive green hills and valleys with amazingly scenic views. There are black monkeys, maleo birds, snakes, wild pigs, hornbills and rusa deer. Located north of Bitung, this nature reserve has several cottages and small restaurants nearby. It is only reachable by four-wheel drive vehicles over a rough road from Girian village. Wakatobi Marine National Park (WAH-kah-TOH-bee): These beautiful waters are off Sulawesi’s southeast coast. The park offers some of the best diving in the world. The Wakatobi is a Marine National Park comprising an archipelago of four large islands located in south east Sulawesi, Indonesia. Wakatobi is the second largest protected marine area in Indonesia. The park encompasses stunning coral reefs, white sand beaches and an amazing wealth of marine life, including whales and dolphins. Wakatobi is positioned at the heart of the Indo Pacific area where marine biodiversity is at its greatest. More than 90,000 people live within the national park, many of whom rely on the reefs and inter-tidal habitats for their livelihoods. These peoples include many interesting cultures and histories. The objective of the marine park management is to balance the needs of the local communities while protecting biodiversity. Wale Papataupan (WAH-lay PAH-pah-Tah-oo-PAHN): Wale Papataupan is a flowery tourist spot with bungalows, swimming pool, steam bath facilities, restaurants, fish ponds, and an open stage for cultural performances. Located at Sonder village, about 37 kilometers from Manado. 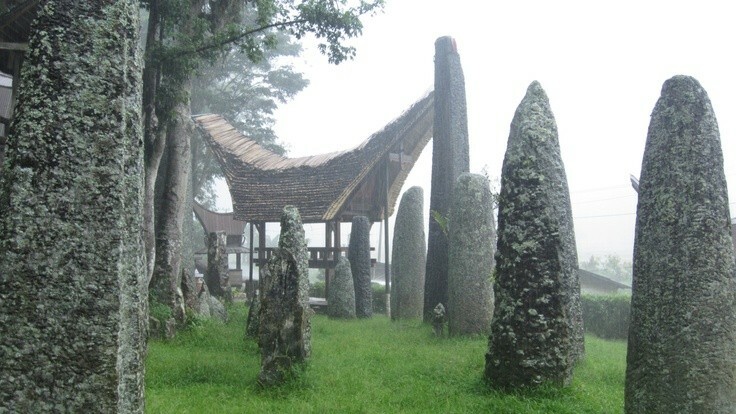 Watu Pinabetengan (WAH-too PEE-nah-BEH-tehn-GAHN): This site consists of a megalithic stone of the ancestors of Minahasa. Its surface is covered with crude, mysterious drawings and scripts, which have never been deciphered. According to Minahasa history, this is the place where the ancestors first divided up the land among the people (Watu Pinabetengan means “the stone of discussion about the division”). The ruling was made in order to ensure a peaceful and harmonious life. Seven divisions were made amongst different areas of Tombulu, Tonsea, Toulour, Tontemboan, Tonsawang, Ponosakan and Pasan Ratahan. This site is located in Tompaso, about 45 kilometers from Manado. Waruga (WAHR-roo-GAH): This is an ancient cemetery with Minahasan ancestors. 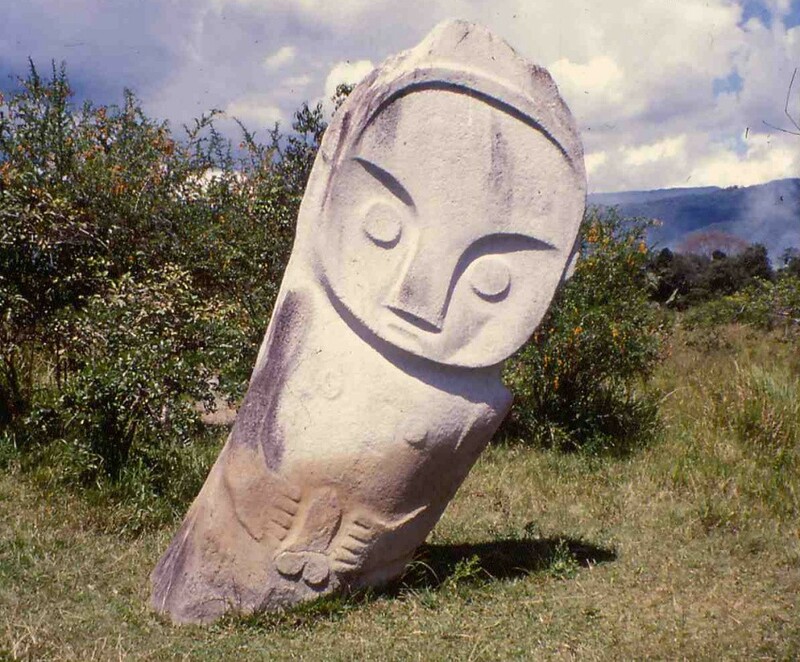 It consists of 144 sarcophagi, which are remnants of the megalithic age. The artistic aspect of the tomb is known by the decorative sculpture and carving around the tombs and the lids with various motifs. Located in Sawangan village, about 24 kilometers from Manado. There are plenty of nice accommodations in Manado and other cities on Sulawesi. Most villages also have of good accommodations for visitors. More rustic arrangements can be made on the diving islands, such as Bunaken and in the highland regions.